Imagine that someone put time and effort into writing, taping, and editing an infomercial. Imagine that people then spent substantial money to air that infomercial on television. I would have assumed that any such infomercial would at least know the name of the product they are trying to sell. I suppose that Lifezymes and Nu-Zymes are different names for the same product, but this is never made explicit in the infomercial. Why in the world would a product name change be made in the middle of putting an infomercial together? Was there some legal reason, or did compelling consumer research that tell them that “Nu-zymes” was a far superior product name than “Lifezymes”? If so, why didn’t they just go ahead and re-shoot the entire infomercial? Operator: Thank you for calling. How may I help you? Caller: I’d life to order Lifezymes. Operator: What the hell are Lifezymes? This is the Nu-Zymes order line, you idiot! So take this as a lesson all you aspiring infomercial producers: Do us all a favor and please decide on the name of your own damn product! You are spot on! I saw the infomercial today and noticed the same discrepency and thought that maybe it was me! They really should check into correcting that so their customers won’t be confused as to what they are actually purchasing. The product idea–enzymes–are critical to health. However, we have no assurance of actual ingredients v. excipients (that which is used to excise the vitamin, which oftentimes are poisons). Plus, when you call, the girl taking the order will read the ingredients (barely if able) and you find out that they’re using gelatin capsules, so you get mad cow as an added benefit. When the same product changes its name, it’s usually because of a lawsuit. So go to a reputable company at a top name health food store and get it there. 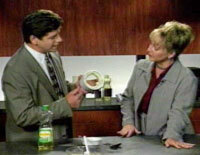 I remember when this tool used to appear on another infomercial, I think it was called “Health Update.” It was masquerading as a legit show (I LOVE those kind of infomercials) and I think it was hosted by some woman named Sherry Renedeer. I have been taking Nu Zymes for 3 years. It is the only thing that has helped my severe acid reflux. Several Dr. recommended substances failed to help to any degree. I don’t care what they call it Nuzymes or Lifezymes. ;…it works for me. UH this wouldn’t have been written by some of Dr. Pinkus’ competitors would it??? I think they called it lifezymes because it refers to enzymes which in latin means life. Not sure but it would make sense…nuzymes, new life…just my input.